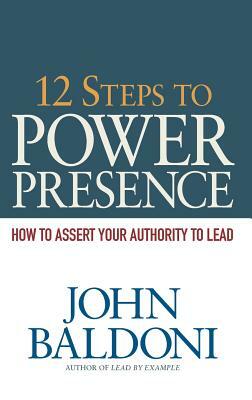 Top 10 Things to Know about 12 Steps to Power Presence 12 Steps to Power Presence focuses on how leaders use their presence as a means of power and authority in order to encourage others to follow their lead. 1. Leaders project power through their presence. Leadership presence is the outward manifestation of leadership behavior. While leaders project their leadership, followers authorize it with their approval. Leadership presence is "earned authority." 2. Leadership presence is more than style, more than communications. It is the projection of the leader's authentic self. That authenticity is comprised of a person's beliefs and convictions and reinforced by behavior. That is, it's not "the talk" that matters it's "walking the talk" that makes the difference. It is what leaders do to convince people to believe in them as people and as leaders. 3. While leaders project power through presence, it is followers who authorize it with their approval. Consider these examples: The plant manager who holds meetings on the shop floor to be close to the work; the school principal who walks down the hallway greeting by name the children who grin and send him a cheerful greeting; the quarterback who steps into the huddle and every player looks to him for the play but also for direction; and the CEO who works in an open plan office and eats in the cafeteria so he can stay in touch with people and listen to their concerns as well as their ideas. 4. The five attributes of authority are decisiveness, accomplishment, persuasiveness, courage, and inspiration. These attributes reinforce your authority to lead. 5. Managers should not shy away from leveraging power nor should they shy away from sharing it. Power is essential to presence and in turn vital to leadership. 6. People remember your honesty. So, if you have to deliver some tough speech, embrace the opportunity. It make sting for the moment, but over time the sting goes away and you are recognized for what you are: a straight talker. 7. Pride in the work is essential to fostering a more energized workplace. And when employees feel such energy they are more likely to want to come to work and do a good job. Morale improves, too, and few workplaces can do without a strong team spirit. 8.Asserting your leadership demonstrates your willingness to take charge and be responsible for outcomes. That's leadership presence in action. 9. Hope is essential to the leadership process. Leaders must instill hope in their people by communicating its importance in thought, word and deed. Hope is essential to outcome -- obtaining results. Hope flourishes on optimism, truth and resilience. 10.To be considered for promotion, you need to leverage your leadership presence to make yourself known, your influence felt, and your results count.When these things happen you will be fulfilling your leadership potential and become the leader that your team needs you to be.